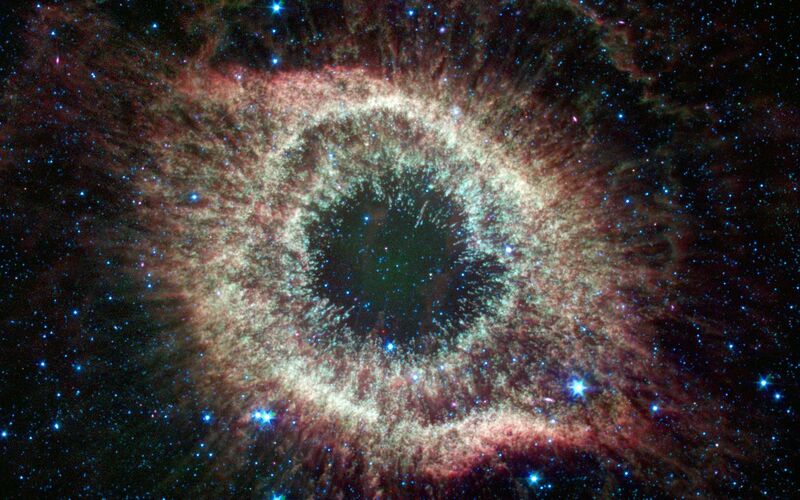 A newly expanded image of the Helix nebula lends a festive touch to the fourth anniversary of the launch of NASA's Spitzer Space Telescope. This spectacular object, a dying star unraveling into space, is a favorite of amateur and professional astronomers alike. 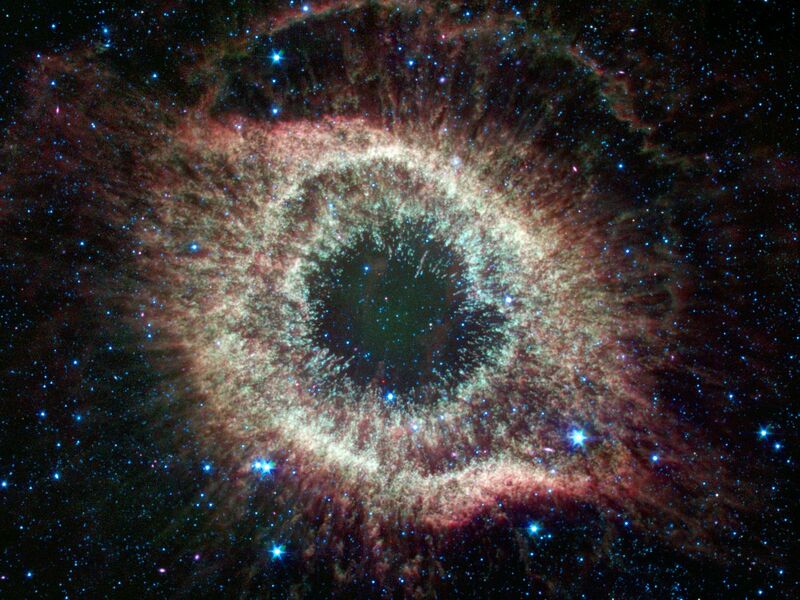 Spitzer has mapped the expansive outer structure of the six-light-year-wide nebula, and probed the inner region around the central dead star to reveal what appears to be a planetary system that survived the star's chaotic death throes. 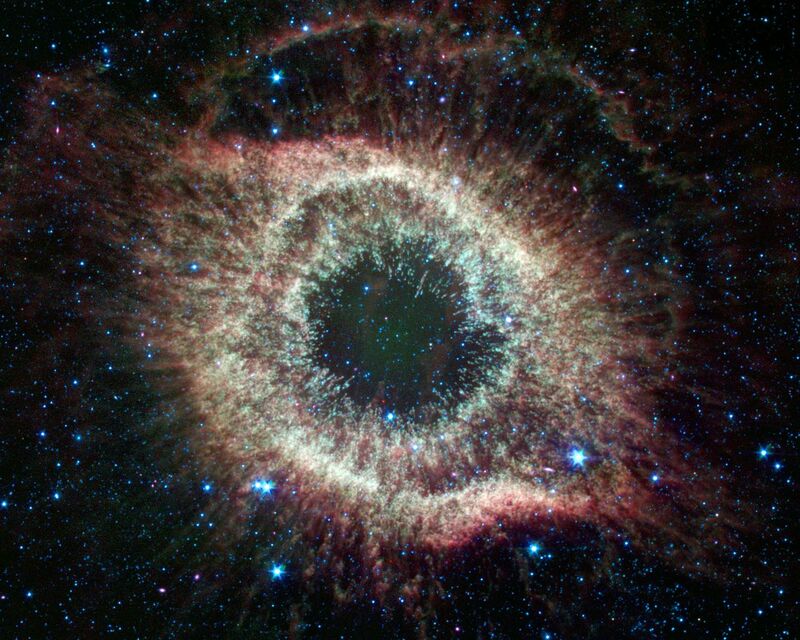 View theoriginal image The Infrared Helix at PIA03294. Spitzer launched from Cape Canaveral, Fla., on August 25, 2003. 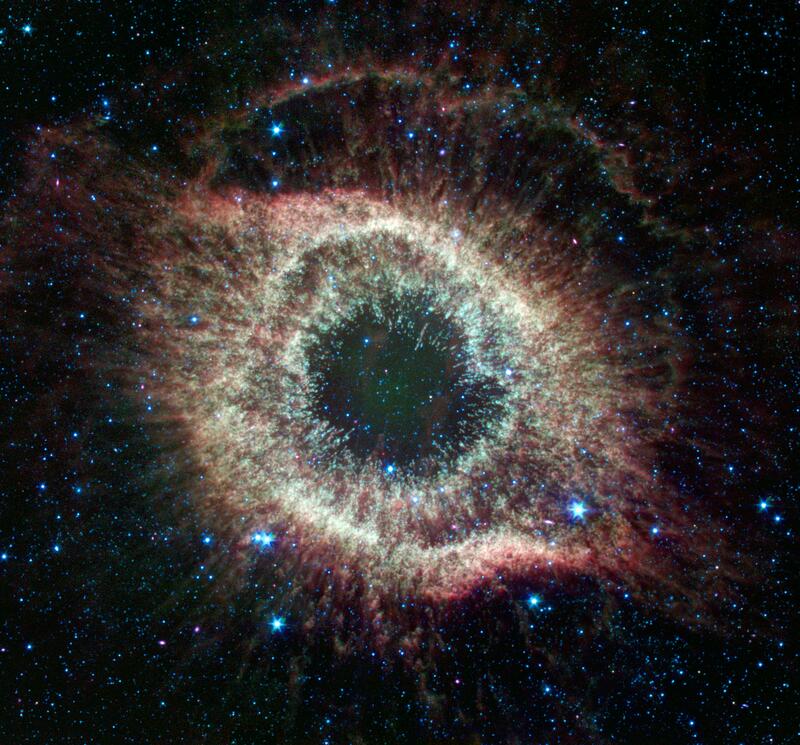 In its four years of operations, Spitzer has provided unprecedented infrared views of objects as diverse as asteroids in our own solar system to galaxies at the edge of the observable universe. Recent discoveries include the first detection of water vapor on a planet orbiting another star and a titanic galactic collision five billion light-years away. Another cause for celebration is Spitzer's excellent technical performance. Spitzer is the first infrared space telescope to use an Earth-trailing orbit and passive cooling techniques, such as a sun shield, to obtain the low temperatures required for an infrared observatory. The design allowed for a much smaller tank of liquid-helium coolant, or cryogen, to chill the telescope, thereby slashing mission costs. The minimum expected lifetime of Spitzer was only two-and-one-half years. Now, Spitzer's cryogen is expected to last much longer, giving the mission a lifetime of more than five-and-one-half years. JPL is responsible for the operations of the Spitzer spacecraft, while science operations are conducted at the Spitzer Science Center at the California Institute of Technology, Pasadena, Calif. Spacecraft engineering is carried out by Lockheed Martin, Denver, Colo., with help from Ball Aerospace Corporation, Boulder, Colo.
For more information about Spitzer, visit http://www.spitzer.caltech.edu/spitzer or http://www.nasa.gov/spitzer.